This is fun, you load up both sides of the automatic card shuffler. The device whirrs, grabbing cards from both sides, forming a jumbled up pile in the middle section. You have a shuffled deck ready to play. You can make up to 2 packs random at once. The sound and action are fun and exciting to watch, so highly enjoyable for children as well as a great aid for people with hand problems like arthritis. Automatic card shufflers Work off of 2 X C batteries, not included. 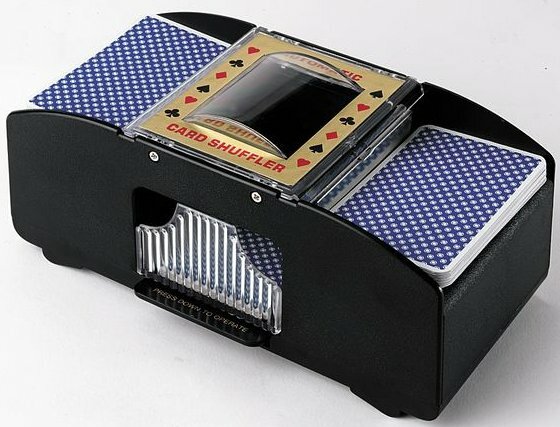 Automatic Card Shuffler text, images and video are copyright.